Can friendship, Star Trek, drama club, and a whole lot of coffee get two nerdy best friends through the beginning of their senior year of high school? To be completely honest, the first thing that drew me to Meg & Linus by Hanna Nowinski was the absolutely adorable cover. (I can’t help it, I adore a good cover.) Then I read the summary for the book, and knew that it was something that I needed to read. This book was super cute; a diverse story of love and friendship. I really enjoyed reading it! In the story we follow Meg and Linus, who happen to be the bestest nerdy friends ever, through the first half of their senior year of high school. The story is told from the alternate perspectives of Meg, who just broke up with her long-time girlfriend, and Linus, who is experiencing his first ever crush on the new boy Danny. I really enjoyed reading the story from the alternative perspectives, as Linus was absolutely adorable experiencing his first crush ever, and my heart completely went out to Meg as she learned to cope with her breakup. I love these two characters, and their friendship was something super special. There were a lot of really great secondary characters as well. The storyline for the book was super cute. It was about friendship, and being nerdy, and first loves and losses. But mostly it was about the friendship between Meg and Linus, which was great, and had its ups and downs just like everything in life. And I love that while the story had swoon-worthy moments for the characters, it was mainly about their friendship. There should definitely be more books in the world like this! 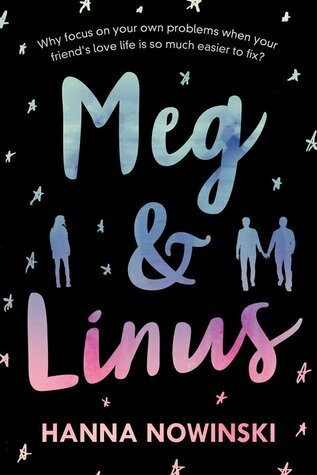 Overall; Meg & Linus was a super cute read, and I’m glad I was able to fit it into my TBR this month! I’m super curious to read more by Hanna Nowinski in the future! Do check out Meg and Linus for a super cute, diverse story of love and friendship!! My April 2017 TBR & Most Anticipated Releases! !